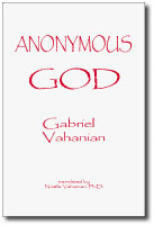 Title: Anonymous God Author: Gabriel Vahanian, Philosophical and Cultural Studies in Religion Imprint: The Davies Group, Publishers soft cover 182 pp. USD 20.00 ISBN 978-1888570571 2002 First published in France as Dieu Anonyme to tremendous critical acclaim throughout Europe, Anonymous God is a compelling interpretation of the biblical tradition that allows it to speak in a radically new manner to contemporary human beings, in a language that is hopeful without being idealistic. It has been translated from the French by Noëlle Vahanian, PhD and recast by the author. Contents Foreword Preface Acknowledgments Chapter 1. Through Whose Language We Are Spoken For — God and the Iconoclasm of Language — Technology and the Utopianism of Faith Chapter 2. Language and Utopia: God — Ushering Nature: The Maker — Shepherding History: The Redeemer — Pleroma of the World — From God who Saves to God who Reigns Chapter 3. Salvation and Utopia: The Christ — Through Whom the Human is God’s Condition — God and Man in the Measure of the Christ Chapter 4. Utopianism of the Body and Social Order: the Spirit — Order and the Spirit — Neither Jew, Nor Greek: The Church Envoi Reviews: “In Anonymous God, Gabriel Vahanian invites us to do theology with him. He calls us to join him in reading today's world and our life in it through the iconoclastic corrective lenses that the Bible is…. Reading Vahanian, meditating his words, opens up before us…a much needed vision that unsettles the comfort of our theological habits and makes room for hope.” — Daniel Patte, Vanderbilt University “In this extraordinary biblical theology of the word Vahanian has given us an account of God's creative utterance, one in which the text exemplifies the linguistic acts it describes…. Spellbinding and profound, this book can be appropriated both as a new poetic liturgy and as a complex text that requires the most attentive reading.” — Edith Wyschogrod, Rice University About the Author: Gabriel Vahanian holds the degree Docteur en Théologie, Strasbourg and that of both Th.D and Ph.D. from Princeton Theological Seminary. Among many prestigious positions held by Dr. Vahanian is that of founder and director of Graduate Studies in Religion at Syracuse University. He is known for several notable books during his time in the United States, among which are counted The Death of God: The Culture of Our Post-Christian Era, Wait Without Idols, No Other God, and God and Utopia: The Church in a Technological Civilization. Since the mid-1980s, Professor Vahanian has been at the Université des Sciences Humaines, Strasbourg. While his theology has continued to develop, most of his publications have been in French and less accessible to an American audience. Anonymous God is a translation of his Dieu Anonyme, which appeared in France in 1989.